There is no difference between Power Washing and Pressure Washing. Power washing is the process of removing surface pollutants such as dirt, mud, mildew, mold and other unsightly adherents from the exterior features of your home or commercial property. On the other hand, there is a difference between soft washing and pressure washing. 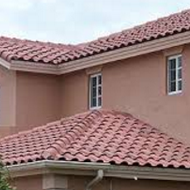 We use a soft washing method on more delicate surfaces such as a shingle or tile roof or the stucco or vinyl siding on the exterior of your home. The Pressure Washing Guys provide both pressure washing and soft washing services to the commercial and residential customers in Costa Mesa. Pressure washing is used more on sidewalks, driveways and concrete or brick surfaces. These surfaces need the expertise of The Pressure Washing Guys to understand and apply the correct pressure on all types of surfaces to ensure there are no damages to your property. We also have the capabilities of using either hot or cold water. When removing gum from concrete sidewalks, we can lower the pressure to melt versus blasting. High-pressure risks damaging the concrete surface and leave etch marks. Our professionals use the correct method when providing service to your home or commercial property. Check out all the different services we have to offer. We can help you with any and all your power washing or soft washing needs. 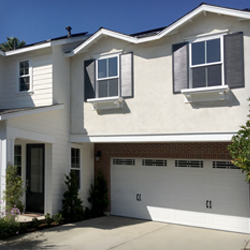 Your Costa Mesa roof completes the exterior appearance of your home. Your roof may be made up of shingles, tiles, wooden planks, metal or other materials. Your roof is your home’s protection from the outside world shielding it from the harsh elements such as rain, wind, storms, and direct sun. They are susceptible to dirt, mold, mildew, and stains. If your roof is left improperly maintained, the results not only look bad but could damage the integrity of the roof’s structure. The Pressure Washing Guys is an Orange County, family owned and operated power washing company that provides professional Costa Mesa Roof Cleaning Services. When cleaning your roof, we use a soft wash or low-pressure method that is safe for your home and the stability of your roof. We believe in providing customers with a high-quality experience, affordable prices, and courteous customer service. Our Driveway Cleaning Service says goodbye to stains, tire marks, grease, grime, oil and rust without damaging the surface or surrounding areas. Whether you are putting your house on the market or just freshening it up, Driveway Cleaning is an affordable service that gives curb appeal to your home. By using environmentally friendly cleaning agents, proper equipment, and tested techniques, our knowledgeable technicians will correctly diagnose your driveway’s condition and can safely return your driveway from ignored to restored! If you need our services don’t hesitate to call, we are happy to answer any questions you may have and provide you with a free estimate. We are here to help. The Pressure Washing Guys offer Paver Cleaning and Sealing services to Orange County homeowners, commercial clients, and property managers. Pavers add elegance to any property. 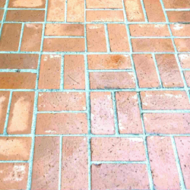 If left untreated, pavers can and will accumulate stains and become an eyesore. A quality sealer after pressure cleaning will allow for easier maintenance during the lifespan of the product. We use a product that is called Seal-n-Lock. The process is much quicker to apply than other products because the sealer can be sprayed onto the surface while the area is still slightly wet. The application of a sealer will not only protect aginst stains or spills from penetrating the surface, but the sealer will also lock in the sanded joints and prevent the pavers from moving and shifting over time. The Pressure Washing Guys have the experience to perform your paver cleaning with the proper environmentally friendly cleaning agents, the right water pressure and then finish with the right sealer to protect your investment. Whether you are looking for improved appearance, protection or stabilizing the paver joints, we are here to help. Listed below are some common causes that can build up over time and require professional pressure washing. So, when your sidewalks, patio, driveway, pool deck or another hard surface area of your home or commercial property becomes dirty, call The Pressure Washing Guys for service or a free quote. 949-332-0909. We look forward to helping you!